This AMF control panel is fitted with BeK3. The panel includes an automatic battery charger, two changeover power switches, terminal blocks, ancillary electronic boards and accessories. The BeK3 module controls a generator connected to the Mains in a standby configuration. 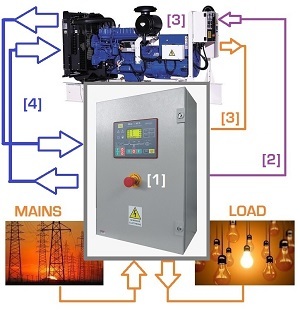 It detects a failure of the Mains and will automatically manage the connection assignment of the LOAD to MAINS or GENERATOR. The BeK3 controller features a CANbus port to connect SAE J1939 compatible engine. These AMF panels are the best choice for heavy industrial applications up to 160kVA. Standard sizes are 25-40-55-60-80-130-160kVA. The Panels are manufactured of steel and coated with industrial grade high-performance paint. The recent updates of the IEC61439 norms are in force. 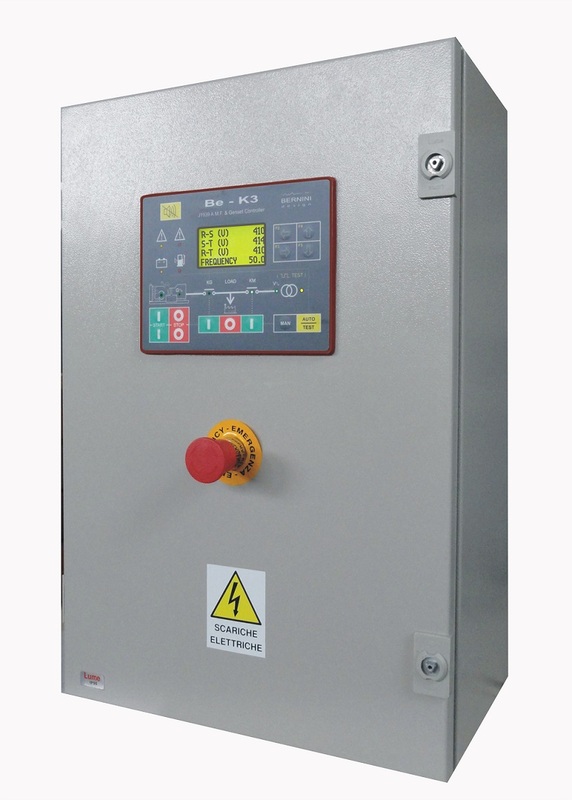 All sizes of auto mains failure control panel BeK3 comply with the IEC61439(-1-2-3-4-5-6-7) standard. These panels comply with the American NFPA110 standards. By using our line of 25-160kVA AMF ATS panels you are able to satisfy any industrial-grade standby specification. The typical connection arrangement is 3-phase with neutral. On request, we can provide mixed solutions. The BeK3 controller is flexible and programmable, you can modify the setting on-site at anytime. Each panel has its own specified nominal current and short circuit current. You have to provide a means to limit the current according to the panel specifications. The auto mains failure controller inside the panel interfaces the engine by means of automotive relays. 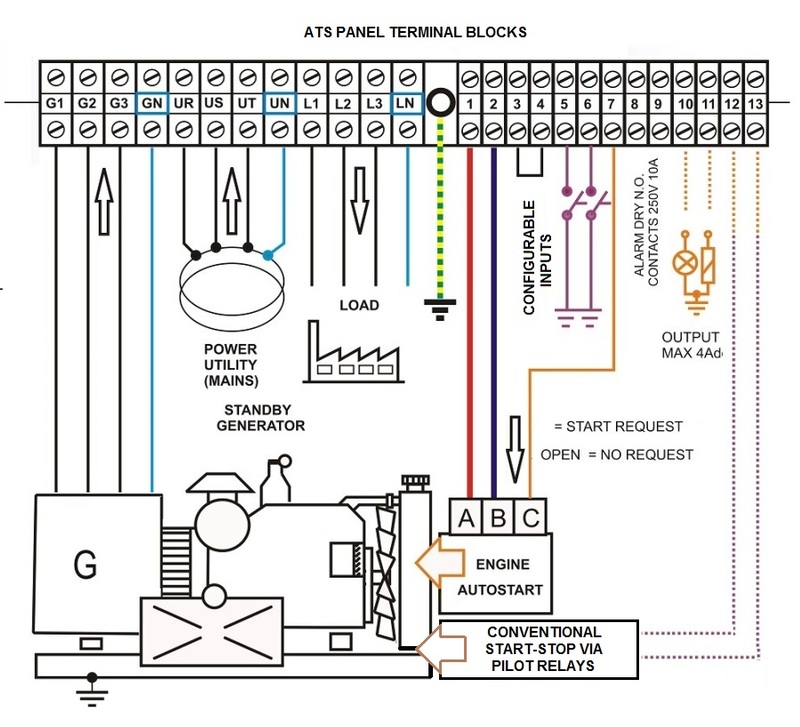 In case of failure, you can find an automotive plug-in relay in any car service shop. But it is important to note that the panel is supplied with a spare relay to save you precious time. The Bek3 controller provides over voltage protection and all input / output lines. For this reason this panel is suitable for heavy industrial applications. Despite the fact that the BeK3 features a CANBUS port, you can connect standard sensors to provide extra protection to your system. Terminals for RS485 serial interface are provided in case you need to control and monitor the panel from a remote location. Software is provided free of charge, but we recommend to purchase our industrial grade MODBUS to USB converter. You can choose the accessories that fit your monitoring requirements. The panel includes all protection fuses to prevent severe damage to the system in case of lightning. A set of spare fuses is also provided.